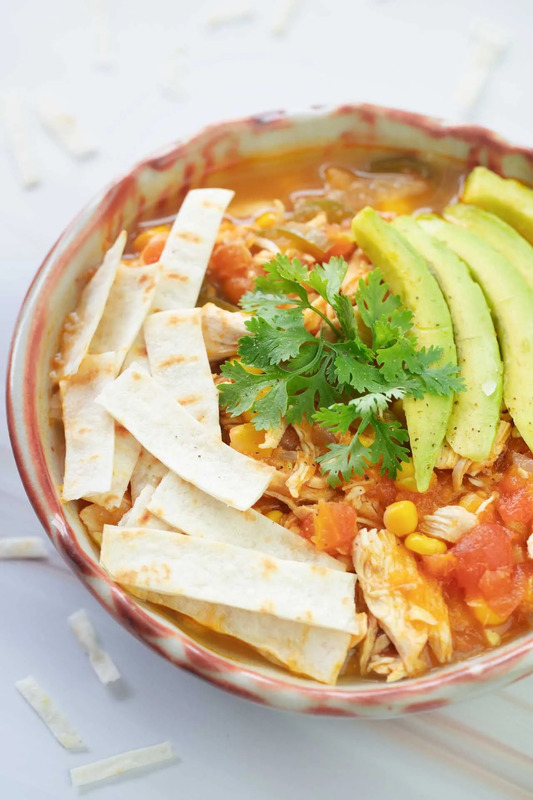 This Tex-Mex style Chicken Tortilla Soup recipe is made from a rich and comforting broth, decked out with healthy servings of veggies, and dotted with roasted peppers & chilli powder to enhance a perfect smoky flavor meal of yours. With just slight spiciness and tender shredded chicken meat, it is either a beautiful surprise for a relative visit or a cozy treat for oneself chased with a cozy tea break. Alright, that was just my autumn French braids talking. A lot of veggies and herbs, indeed. You can check all 13 of them in the list below to see how they roll, but one sure thing – they’re all healthy and probably on-hand foodstuffs. There isn’t a cost hit to preparing it at all. But then there’s the sprinkling part. I’d say that it’s not the ingredients, but rather the toppings that take the soup to the next level of a showstopper. Oh yeah, you’d probably get my next line. What can tortilla strips do better in a tortilla soup rather than floating, nourishing the rich flavor for your soup pot? Personally speaking, I, without a doubt, would always prefer things rounded up with ripe avocado slices (if not, lots of them). But anyway, suit yourself! For those on Keto diet, however, some extra sprinkles of shredded cheese instead of tortilla chips or starch would make it a beautiful end for a well-rounded meal. How to make chicken tortilla soup thicker? Suggested right from its name, tortilla chips are the very first ultimate agent when it comes to increasing the thickness of the soup. Simply throw a few scraps of tortilla chips right into the boiling pot and let them dissolve completely. If it’s only after you’re done that you find out how dissatisfied you are with a watery soup, then put the soup to reheat together with tortilla chips. All done. Still a bit musty? Then check out the alternatives below . Starch: Apart from the top-flavored tortilla chips, starch is definitely the first runner-up. All you need to do is whisk a tablespoon of starch with some water to create a compo, then pour it right in the chicken soup bowl while still piping hot. The starch will then be disrupted under high temperature and its granules will also absorb the liquid to swell and thicken, giving you the creamy soup of your dreams. Stale bread crumbs or Oats: Theoretically, bread crumbs are also starch, so both stale bread and oats can work the same way that tortilla chips do – they absorb liquid when soaked in water, then turn to a purée state to give you a fine consistency in texture. Stale bread is also specially favored for varying in flavors and aroma, for example rosemary or thyme. Yogurt or coconut milk: Plain yogurt might taste a bit sharp and tangy on the tip of your tongue, but it’s hands-down the easiest way of all for someone who is demanding a perfect creamy soup texture without a starchy feeling, unlike all of the above options. The same goes for coconut milk. Their hearty sweetness is undoubtedly ingenious and captivating to the taste buds. Also, try Greek plain yogurt if possible. How many calories are in a bowl of chicken tortilla soup? Roughly 130 calories, I’d say. Fat is low, and so is the carb content, so basically, there’s nothing to get angsty about. For something this good-tasting but so earthy, I doubt there is even the least guilt about gulping 2 bowls of it. Just dump in either cheese or chips or whatever you could think of that fits your diet plan. If I have to put one bottom line, then it should be this: A soup that tastes like a crazy cheat meal, but is actually a girl-next-door type of goodness. The amazing thing is, it takes you only more than an hour, but will arrive at the table like a piping hot gourmet meal that demands great enthusiasm to be done. So warm and mouth-watering. Toppings optional: gluten-free tortilla chips , avocados - cut into thin slices or cubes. Sauté on medium high heat with olive oil: onion, garlic, jalapeño and green pepper. Remove the sautéed combination in step 1 from the pan and transfer them to a large pot with the remaining ingredients. Bring them all to a boil. After 15 minutes counting from reaching its boiling point, remove the 4 chicken breasts and shred them in strips with a fork. Note that the chicken strips should not be shredded too thinly so as to result in a better mouthfeel. Return the shredded chicken meat strips to the pot and give it a simmer for another 45 minutes. Serve: Crack out some crispy tortilla strips or avocado slices to top your soup if desired. Love a good healthy soup! This chicken tortilla soup looks so good! Aww, thanks Phi 😀 So colorful yet so tasty and wholesome, isn’t it? Enjoy!